Many investment and policy decisions in water management have significant and often long-term consequences. Moreover, long-term objectives often require near-term decisions. Making sound near-term decisions is critical, yet we live in an increasingly unpredictable dynamic world governed by competing and changing beliefs and preferences. When decision makers and analysts face a deeply uncertain future (e.g. due to climate change), they need more than traditional prediction or scenario-based decision methods to help them to evaluate alternatives and make decisions. The Dynamic Adaptive Policy Pathways (DAPP) approach aims to support the development of an adaptive plan that is able to deal with conditions of deep uncertainties. The approach is developed by Deltares and TU Delft and has inspired the Adaptive Delta Management concept of the Dutch Delta Programme. An adaptive plan specifies actions to be taken immediately to be prepared for the near futures and actions to be taken now to keep options open to adapt if needed in the future. 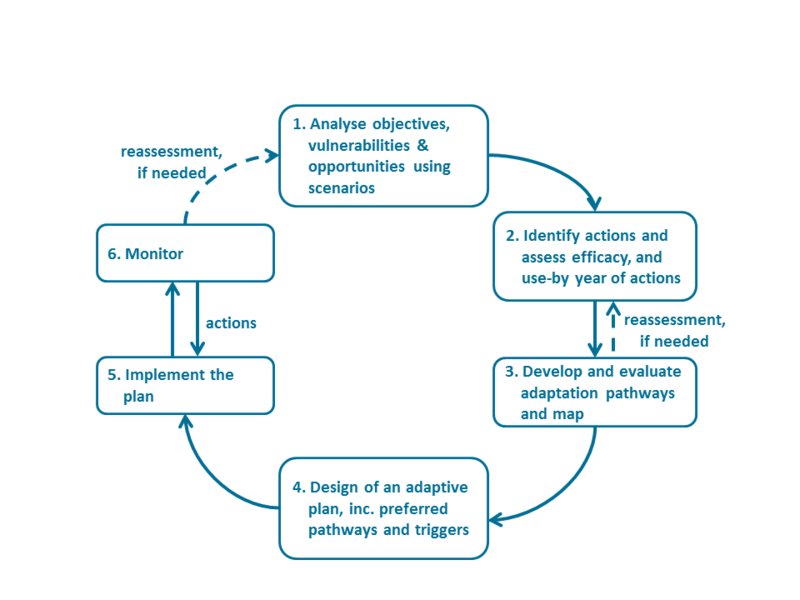 The exploration of adaptation pathways is one of the main ingredients of an adaptive plan. A monitoring system collects information to get early warning signals (triggers) for implementation of actions or for reassessment of the plan. This figure illustrates the DAPP approach. Adaptation Tipping Points (ATP) are a key concept in DAPP. An adaptation tipping point specifies the conditions under which the status quo, a policy action or a portfolio of actions will fail. An adaptation tipping point is reached when the magnitude of external change is such that a policy no longer can meet its objectives, and new actions are needed to achieve the objectives. The timing of an adaptation tipping point (the sell-by year of actions) is scenario dependent. More information on the ATP’s is given below. DAPP policy analysis begins with the identification of objectives, constraints, and uncertainties that are relevant for decision-making. The uncertainties are then used to generate an ensemble of plausible futures. These futures are compared with the objectives to see if problems arise or if opportunities occur. 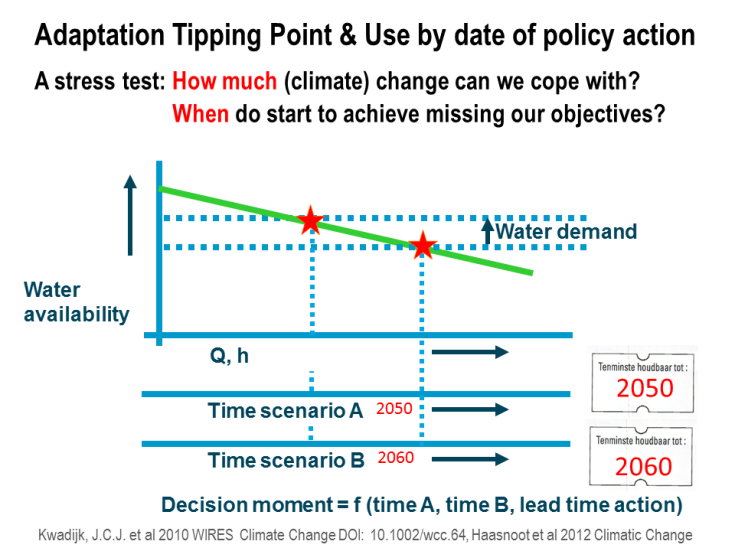 This determines if and when an adaptation tipping point may occur and thus when policy actions are needed. Based on the vulnerabilities and opportunities actions are identified. The performance of each of the actions and pathways is assessed in light of the defined objectives to determine its adaptation tipping point. Promising actions are used as the basic building blocks for the assembly of potential adaptation pathways (a sequence of actions), that can be presented in an adaptation (pathways) map. A scorecard presents the costs and (co)-benefits of each of the pathways. The figure below gives an example of such an adaptation map and scorecard. Subsequently one or more preferred pathways can be selected as input for an adaptive plan. The aim of this plan is to stay on the preferred pathway as long as possible. For this purpose, contingency actions are specified and a trigger for each contingency action is specified and monitored. Adaptation pathways describe a sequence of policy actions or investments in institutions and infrastructure over time to achieve a set of pre-specified objectives under uncertain changing conditions. An adaptation pathways map provides insight into policy options, the sequencing of actions over time, potential lock-ins, and path dependencies. Adaptation pathways have been developed in several projects. For example EU RISES, BASE and Thailand . An example of an adaptation pathways map and a scorecard for each of the pathways. In the map, starting from the current situation, targets begin to be missed after four years; an adaptation tipping point is reached. Following the grey lines of the current plan, one can see that there are four options. Actions A and D should be able to achieve the targets for the next 100 years in all scenarios. If Action B is chosen, a tipping point is reached within about five more years; a shift to one of the other three actions (A, C, or D) will then be needed to achieve the targets. If Action C is chosen after the first four years, a shift to Action A, B, or D will be needed after approximately 85 years in the worst case scenario (follow the solid green lines). In all other scenarios, the targets will be achieved for the next 100 years (the dashed green line). The colors in the scorecard refer to the actions: A (red), B (orange), C (green), and D (blue). The point at which the paths start to diverge can be considered as a decision point. Taking into account a lead time e.g. for implementation of actions, this point lies before an adaptation tipping point. The concept of Adaptation Tipping Points emerged in response to a desire among Dutch policymakers to make it easier to update plans in light of new climate scenarios. It is a so-called vulnerability/bottom-up approach. An adaptation tipping point is reached when the magnitude of external change is such that a policy no longer can meet its objectives. The timing of this point (the sell-by year of actions) is scenario dependent. 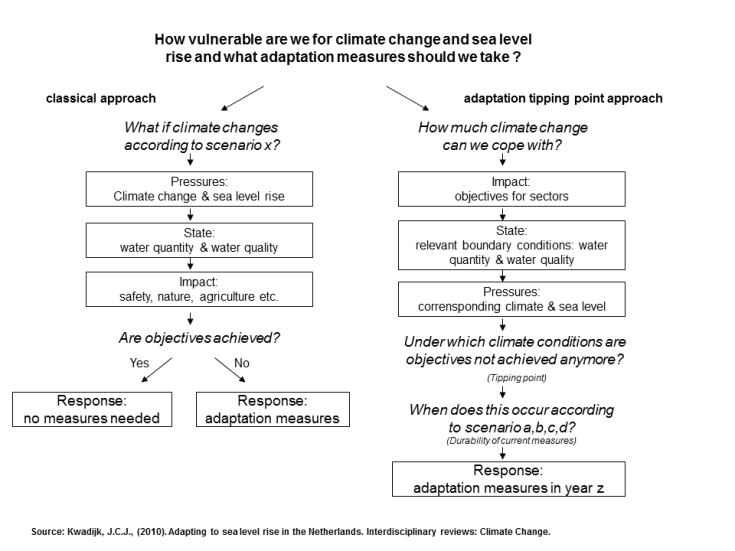 This way a plan can easily adapted in case of new information on changing conditions such as new (climate) scenarios; in which case only the timing of actions needs to be adapted. Example of an adaptation tipping point. If water availability decreases due to e.g. climate change, there may be a point at which there is insufficient amount to supply the demand. The timing (sell-by year of the status quo or policy action) may come earlier in a fast changing climate and later in a slower changing climate. A Review of Planning Approaches for Adaptation Under Deep Uncertainty. Sustainability 2013, 5, 955-979. Walker, W.E., M. Haasnoot, J.H. Kwakkel (2013). Fit for Purpose: Evaluating and Building a Fast, Integrated Model for Exploring Water Policy Pathways. Env. Modelling & Software. Haasnoot, M, Van Deursen, WPA, Guillaume, JHA, Kwakkel, JH, Van Beek, E., and H. Middelkoop. Using adaptation tipping points to prepare for climate change and sea level rise: a case study in the Netherlands. Interdisciplinary reviews: Climate Change. Kwadijk, J.C.J., M. Haasnoot, J.P.M. Mulder, M. Hoogvliet, A. Jeuken, R. van der Krogt, N.G.C. van Oostrom, H.A. Schelfhout, E.H. van Velzen, H. van Waveren, M.J.M. de Wit. (2010). A method to develop sustainable water management strategies for an uncertain future. Sustainable Development, 19, 369-381, Haasnoot, M., Middelkoop, H., van Beek, E. & van Deursen, W.P.A. (2011).